Knitting: "Zipper "See My" Vest"
Whenever I see the Lamb's Pride yarn in a more upscale yarn boutique, I get a craving to buy piles of it. The colors are so vibrant, it's a soft, thick wool, and I love the single-ply style. When I found four skeins (of the same dye lot!) on scale in a gorgeous fuchsia, I nabbed it up and was left with the problem of what I could make with it. The first nibblings of spring and the desire for warm clothing a bit less oppressive than the heavy winter sweaters I'd been wearing sent me searching for a vest pattern. After finding too many preppy pullovers and antique-styled button-ups, I finally located the Greg's Vest pattern free on-line. It's styled like a fleece zip-up vest, and was exactly what I was looking for, in a simple enough pattern I knew I could alter it if necessary. The first adjustment I had to make was for the yarn. For me, at least, Lamb's Pride Worsted works up at a bit higher gauge than regular worsted; dropping down enough needle sizes to meet gauge would have made the fabric inflexible. Fortunately, the pattern was for a child's size 14 and I wanted my vest a bit larger, so I just proceeded with my off gauge, making sure I checked pieces against each other for fit as I went along. I also decided that the moss stitch, while lovely, detracted from this yarn, and worked the vest in a straight knit stitch instead. I kept the rest of the pattern as-is, though one could easily adapt the collar into a regular crewneck style and continue the zipper up it, rather than the fold-over collar shown here. 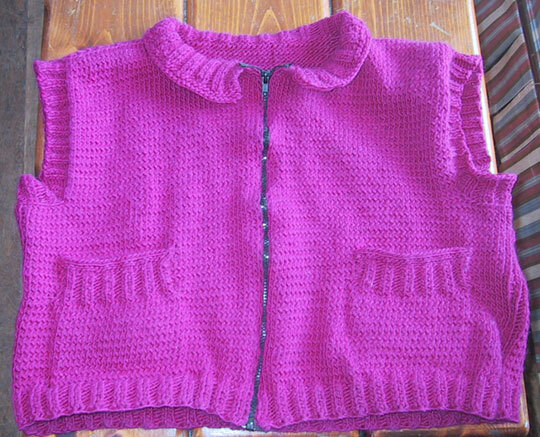 As a whole, the vest worked up very quickly - I knit the whole thing in about a week. My four skeins of Lamb's Pride, at 4oz and about 190 each, turned out to be just perfect, with perhaps a third of a skein leftover. Following the pattern, the vest hits just below the waste and is fairly roomy all around. I'd recommend any knitter print themselves out a copy of this pattern. 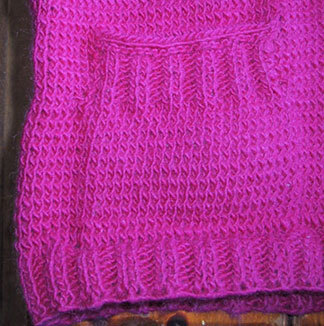 It's a great basic vest pattern and is very easy to adapt to your own needs. I can see myself making other versions in the future.